When an item is X-rayed, some of the X-rays pass straight through and some are absorbed and do not come out the other side. It is the density (Atomic Weight) and thickness of materials that determine how easily X-rays pass through them. Scientists have mapped the atomic structures of all matter, graded the various densities, and display them in what is called the ‘Periodic Table of the Elements’. The lower the density of any material, the more transparent the material is to X-rays and the lighter the image will be on security X-ray equipment. The denser an item is, the darker the image will be. If no X-rays can penetrate an item, because of it extreme density or thickness, it will produce a totally black image (X-ray Opaque). The term “X-ray Signature” refers to the patterns an item produces on the X-ray machine monitor. An item’s X-ray signature differs in several important respects from an ordinary photographic (optical) image. The main difference is that the X-ray image is formed as a function of the x-rays’ absorption when passing through material, whereas a photographic image is formed by light reflecting from an object’s surface. So a photographic image gives information about an object’s exterior, whereas X-ray supplies information about the composition, density and thickness of an object’s internal structure. That’s why many objects look so different under X-ray to how they look in reality. 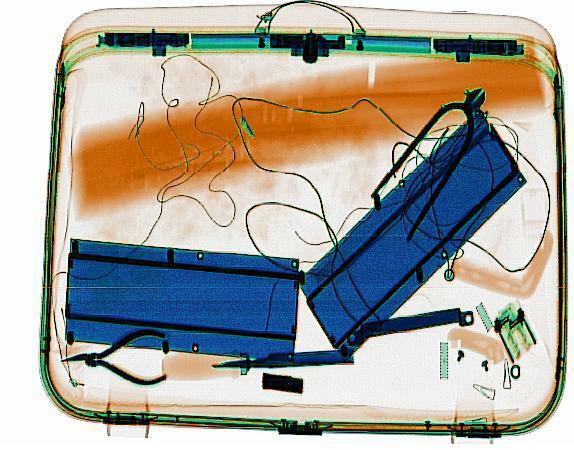 An X-ray image of a bag may be thought of as an image composed of superimposed and overlapping “shadows” of absorbing materials in the bag, created on a computer screen. The x-ray screener is faced with identifying these silhouettes, artificially coloured to represent any of three main categories of materials: 1. Organic (Orange), 2. Inorganic (Blue), and 3.Mixed (Green), or coloured with Pseudo Colour which is artificial colourisation of grey levels. Artificial colourisation is extremely useful because humans can distinguish thousands of colours, compared to just a few levels of grey. Artificial colourisation can assist in identifying certain threats amongst clutter. Low density organic materials, such as paper, wood, clothing, foodstuffs and plastics will show up as various shades of orange. Explosives are organic materials, so will appear as an orange shadow – the darkness of the shadow will depend on the thickness of the explosive material. Explosives may not ALWAYS appear orange if they are masked by inorganic materials – then the colour shown will be a composite of the two materials. Denser, inorganic materials such as metals, glass, chinaware will show as green or blue. Items with a mixture of both organic and inorganic materials will show up as green. Very high density materials, such as lead, will show up as black. Material containing lead (e.g. lead crystal) will also appear black, and will mask other material. The X-ray operator should take into account the shading of the various colours as, obviously, layers of a less dense material will show up as similar to a dense material – for example a box of photocopying paper will appear a very dark orange, in fact almost black. Where inorganic materials hide organic materials (e.g. fruit in a tin) the metal of the tin will be displayed. Many thermo-plastics, which are made of both organic and inorganic substances (e.g. suitcases, televisions etc. ), will probably be displayed as green. When the human body is X-rayed, the bones, which are composed of elements of a higher atomic weight than the surrounding flesh, absorb the radiation more effectively and will cast darker shadows on a photographic plate. However, a different type of X-ray image is produced in medicine, called Neutron Radiography. This gives the opposite effect in images produced, which is why bones look white in medical X-rays, even though they are denser than the surrounding tissue and organs. In a security x-ray, the denser an area – the DARKER it appears.